Relaxing times call for a relaxing recliner with heating, vibrating and massaging features from HomCom. Enjoy a comfortable vibration massage and soothing lumbar heat treatment with the Homcom PU Leather Heated Vibrating Massage Recliner Chair with Remote. 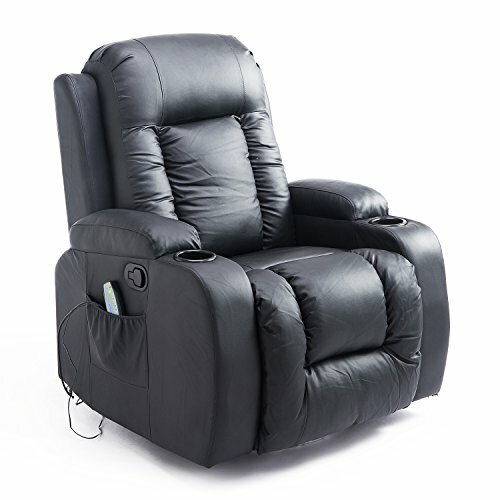 Whether you're reclined and reading a book, watching a movie or simply sitting and enjoying a massage, the soft padded upholstery provides an enjoyable experience with 5 different pre-programmed modes and two varying intensity levels. The 8 vibration massage motors target 4 zones in the upper and lower back, thighs and calves which the user can use all at once or select individually. The chair is stable and supportive with a metal steel frame, 360 degree swivel, 150 degree adjustable recline and the ability to hold up to 375 lbs. It's also convenient, with a remote control and 2 cup holders. Release the stress of a long day with your own personal massage therapist right at home! - Power Cord Length: 70"
✔ RECLINE IN COMFORT AND STYLE: Not only relaxing, but also beautiful, the HomCom PU Leather Heated Vibrating Massage Recliner Chair with Remote makes a stylish and comfortable addition to any living space. ✔ HEATING FUNCTION BUILT-IN: A heating function in the waist area warms and soothes the body's aches and pains as you sit and recline, meaning that it's not only relaxing, but also beneficial to your overall well-being. ✔ SELECTABLE MODES AND LEVELS: No matter what you're in the mood for you'll find it, with five pre-programmed modes and two intensity levels to choose from, so there's something for everyone to enjoy. ✔ REMOTE CONTROL & DRINK HOLDERS: Includes a handy attached remote control to adjust the chair at your own personal convenience plus a side pocket to hold it as well as two cup holders for drinks and more.